WE ARE OFFICIAL NUMAX SELLERS. TWIN TERMINAL POSTS ALLOWING ADDITIONAL LOAD CABLES. SUITABLE FOR MOTORHOMES/CARAVANS/BOATS ANS MORE. L 330 x D 173 H 242 (approx)-to top of terminals. Other Specs are - 500 +. Cycles at 70% Depth of discharge - 1000 CCA. AB31 - AB38, AB40 - AB56, KW1 - KW17, PA20 - PA78, PH4 - PH50, IV, HS, ZE, TR21-25, KA27-KA28, PO, JE, IM, BT, Channel Islands. CALL IN AND HAVE A CUPPA! THESE CIRCUMSTANCES IF THEY SHOULD OCCUR ARE NORMALLY OUT OF OUR CONTROL I. COURIER PROBLEMS, THANK YOU Important Note: Please do check the Dimensions and positive and negative terminal (post) layout and terminal type against your old battery or battery tray where the battery is placed in the vehicle before purchasing the battery. Batteries on the web is the battery department of Pellon Tyre and Auto Centre. Based in Halifax, West Yorkshire, but not far from Bradford, Leeds and Huddersfield, we are only a short drive from Lancashire. For details of how to reach us, see the find us page. We offer quality batteries at discount prices, delivered overnight to UK destinations. We Dispatch by COURIER usually next day 99% but may take two days on occasion. You can collect if you prefer. Our Courier Company always tries to deliver the parcel twice only after that you have contact them to arrange the collection within three days of second attempt and collect your parcel from their nearest depot to your home otherwise they will send the parcel back to us. 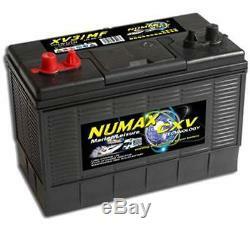 The item "110AH Leisure Battery Numax XV31MF CXV for Leisure & Marine Range" is in sale since Sunday, January 20, 2013. This item is in the category "Vehicle Parts & Accessories\Car Parts\Electrical Components\Other Electrical Components". The seller is "batteriesontheweb2011" and is located in Halifax. This item can be shipped to United Kingdom.